Size:3 in 1 Functions: Measure soil MOISTURE, PH and LIGHT levels Easy to use: No Battery needed, Plug and read Scientifically accurate: keep your plants in a healthy range How to use: Simply insert the probes into the soil, and you'll get your reading Ideal tool for indoor/outdoor plants, help your plants grow healthy and strong Specifications: PH Range: 3.5-8 Ph (3.5-6.5 ACID, 7 NOR, 7-8 ALKALI) Moisture Range: 1-10 (1-3 DRY, 4-7 NOR, 8-10 WET) Relative Light: 0-2000 lux (0-200 LOW, 200-500LOW+, 500-1000 NOR 1000-2000 HGH) Size: 6 x 28 x 5cm [2.36 x 11 x 2"] Probe length: 18cm [7.1"] Copper probe diameter: 4.8mm Alu probe diameter: 5.1mm Distance between probes: 1.2cm Color: Green Package weight: 107g Instructions: Step 1: Switch moisture/pH/light position Step 2: Stick the probe into the soil about 2-4 inches Step 3: Adjust the position of the probe until the pointer on the dial swing slightly Step 4: After 10 minutes, Note moisture/pH/light level in the dial Step 5: Remove probe from soil and wipe clean after each use Important Tips: 1. Do not touch the stone or hard rock soil, if the soil is too hard and dry, easy to damage the probes. Copper and Aluminum itself does not belong to the hard material, so if the soil is too dry and hard to insert, you can use auxiliary agricultural tools drill hole and then insert. 2. Design for testing soil ONLY. Do not be used to test pure water or other liquid, electrolytic response index will be affected, can only be used to measure the soil. 3. After using, need to clean and wipe the probes. Don't be inserted in the soil for a long time while using. Package Included: 1 x 3 in 1 Soil Tester If you find what you believe is defect, please contact Covery Support. 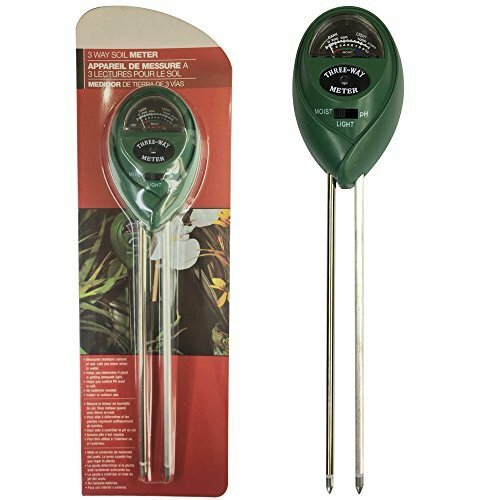 Easy to use --- Simply insert the probes into the soil about 4 inches, and you'll get your reading Ideal tool for indoor/outdoor plants, help your plants grow healthy and strong.No batteries needed, Indoor or outdoor use.  Function --- 1,Measures moisture content of soil to lets you know when to water 2, Helps you determine if plant is getting adequate light 3, Helps you control PH level in soil, acidic or alkaline is suitable for your plants. Service --- In order to make you enjoy 100% satisfactory service, if you find any problems or defects in the product within 12 months from the date of purchase, please contact us in time. We will provide you with replacement or refund service. Professional accuracy --- Sensitive probe could sense changes of the soil and transfer details to the conductor, displaying the accurate values for you.  Important notice ---1, Do not touch the stone or hard rock soil, if the soil is too hard and dry, easy to damage the probes. 2. Design for testing soil ONLY. 3. After using, need to clean and wipe the probes.4.measurement of moisture and pH must be viewed while the unit is in the soil,And, the tester must be kept in the soil for 10 minutes or more. If you have any questions about this product by Beepandles, contact us by completing and submitting the form below. If you are looking for a specif part number, please include it with your message.